Thread Magic was designed for one purpose—to condition thread. It makes thread more manageable and extends the lifetime of finished work for many years—far longer than untreated or wax treated threads with none of the disadvantages of wax products. Thread Magic is totally unique, patented, and guaranteed to work. Thread Magic makes sewing easier! It reduces thread friction and drag by 400% over wax and 700% over untreated thread. This means less hand and wrist fatigue plus less wear on fabric. Thread Magic extends the lifetime of your projects! It creates an invisible and virtually impenetrable coating on your thread to protect it from color-damaging UV rays, mold and mildew. Thread Magic reduces thread drag friction. More damage occurs during making a piece than during the rest of its lifetime, including wear, laundering, or environmental conditions. It is caused by continual pulling of the thread in and out of the work. 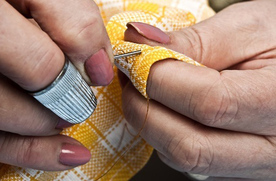 Waxes produce a sticky coating requiring more force to pull the thread and causing greater stress on the fibers. This is stress is compounded when multiple thread passes are required. Thread Magic produces a smooth, slippery coating reducing this stress, and because the threads repel each other, they never actually touch, even when multiple passes are required! Thread Magic protects against UV rays, mold and mildew. Thread Magic actually deflects UV rays. This protects thread dyes sunlight. Colors remain vibrant for far longer than waxed or untreated threads. Also, the Thread Magic coating creates a moisture barrier to prevent the growth of mold and mildew. Thread Magic reduces tangling & knotting with static electricity! As Thread Magic is applied, friction creates a small charge of static electricity along the thread. When the needle is threaded, the main thread and the tail have a similar charge and are repelled from each. This helps prevent them form becoming tangled. Even if the thread becomes knotted, you will find it almost unties itself, especially if it is shaken, because the threads are repelled from each other! Thread Magic is designed for both machine and hand sewing. 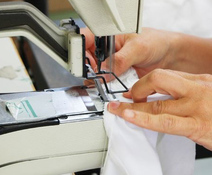 It reduces thread breakage and skipped stitches with metallic, silk and rayon threads, and in high-speed sewing including machine embroidery. Thread Magic will never clog or gum up machine parts. Its lubricating properties are actually beneficial. Thread Magic reduces hand and wrist fatigue. Thread Magic helps the thread move through the material with far less drag than uncoated thread. The needle can be held with a much looser grip for greater comfort and less cramping. Holding the needle more loosely means less wrist fatigue as well. Thread Magic won’t melt or freeze like wax. Thread Magic is a unique, completely safe chemical compound. It will not freeze or melt like waxes do. It can be left in the sun and needlework made with Thread Magic treated thread can be ironed and dried in a drier with no fear of the coating melting or bleeding onto the fabric. At temperatures above 600 degrees, Thread Magic simply evaporates. Thread Magic is acid-free and non-toxic. Thread Magic isn't acidic or toxic. Its PH is 7. • Thread Magic can be laundered & ironed without staining or marking thread or fabric. • Thread Magic is an inert compound, it won’t be harmed by detergent, fabric softener, or even bleach. • Thread Magic is safe for use on all types of thread or fabric. Thread Magic is NOT a petroleum product. Thread Magic is a completely safe, synthetic chemical compound.